Prepare to swoon for these Chicken Sesame Noodles. 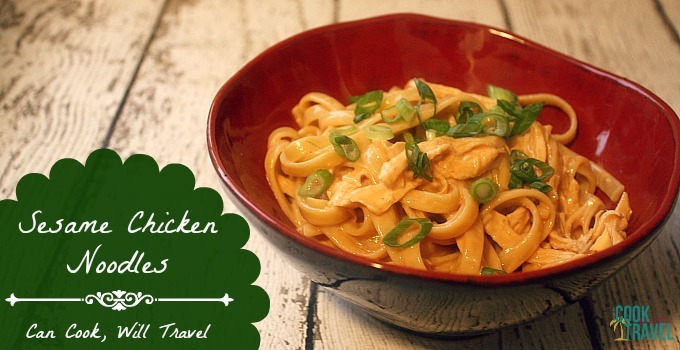 Here’s what you’ll need: Red Wine Vinegar, Tahini, Sesame Oil, Chili Oil (or Mongolian Fire Oil is what I used), Soy Sauce, Peanut Oil, Kosher Salt, Honey, Fettuccine, 8 ounces of Chicken Breast (boneless and skinless), Cayenne Pepper, Garlic Clove, & 2 Scallions. 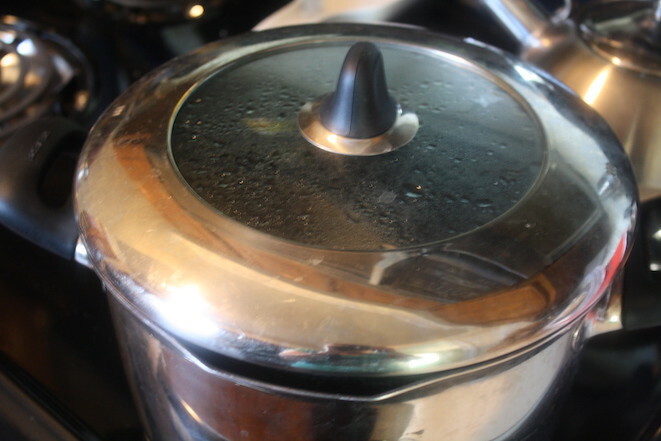 Begin by filling a large pot about two-thirds full and bring the water to a boil. 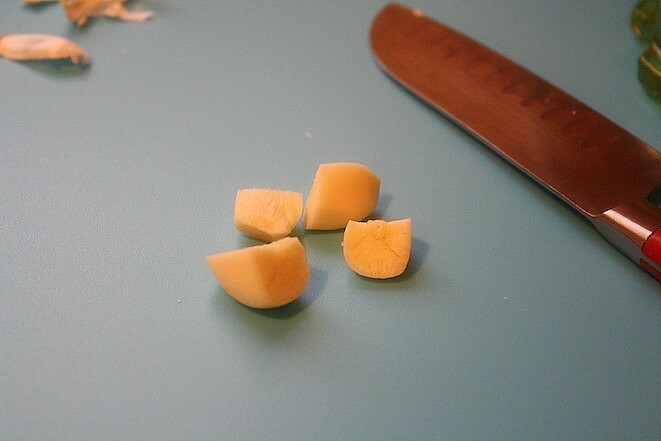 While the water boils, remove the skin from the garlic clove and cut off the stem. At this point, the water was boiling. Drop the chicken in the pot, put the lid on it, and remove the pot from the heat. If you’re using 1 chicken breast, set a timer for 15 minutes, or if you’re using 2 smaller chicken breasts start with about 12 minutes. Let the chicken poach in the hot water off of the heat. As the chicken cooks, wash and trim 2 scallions and thinly slice them. When your chicken timer goes off, remove the chicken from the water (and DO NOT get rid of the water) and cut through the thickest section to make sure that it’s cooked all the way through, which mine was. If yours isn’t, put it back in the water for another minute or two until it’s fully cooked. 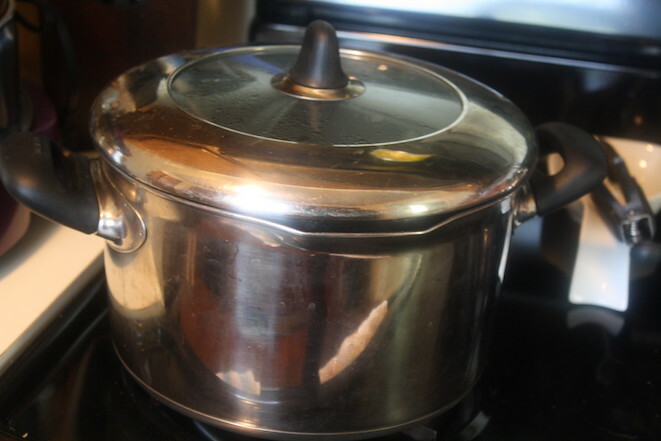 Then place the lid back on your pot and bring the water the chicken cooked in back to a boil. Once the water is boiling, add 8 ounces of fettuccine and cook it according to the package instructions until the pasta is al dente. 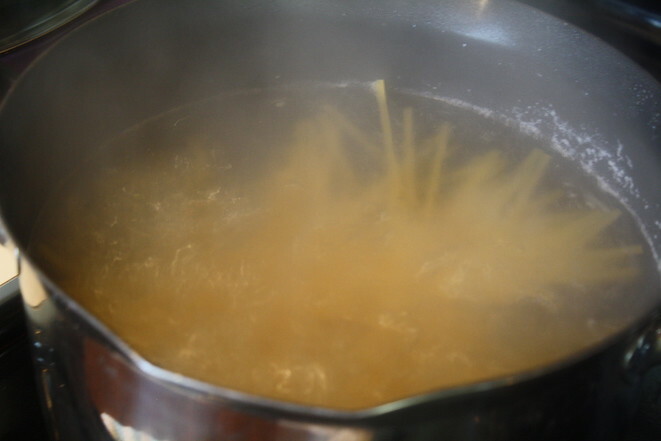 Once the pasta is cooked, drain it in a colander and rinse it thoroughly with cold water to stop it from cooking. Then shake really well to drain off the excess water. As the pasta cooks, mix up the sauce. In a medium-sized bowl add: 1 teaspoon of sesame oil, 1/4 cup of peanut oil, 1/4 cup of tahini, 3 tablespoons of soy sauce, 2 tablespoons of red wine vinegar, 2 teaspoons of chili oil (or Mongolian fire oil), 1 teaspoon of honey, 1/2 teaspoon of cayenne pepper, and the minced garlic. 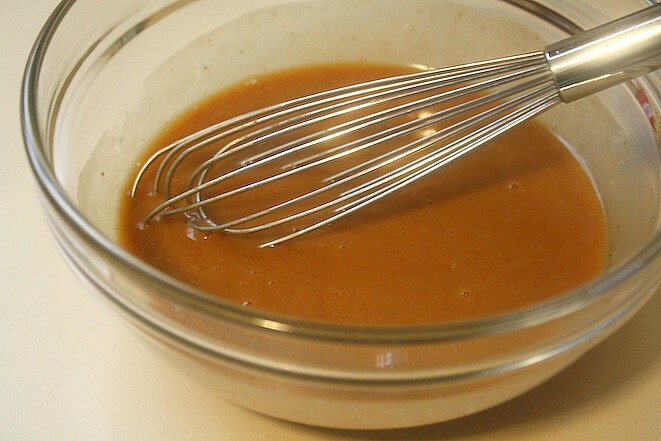 Whisk the sauce really well until it is smooth. 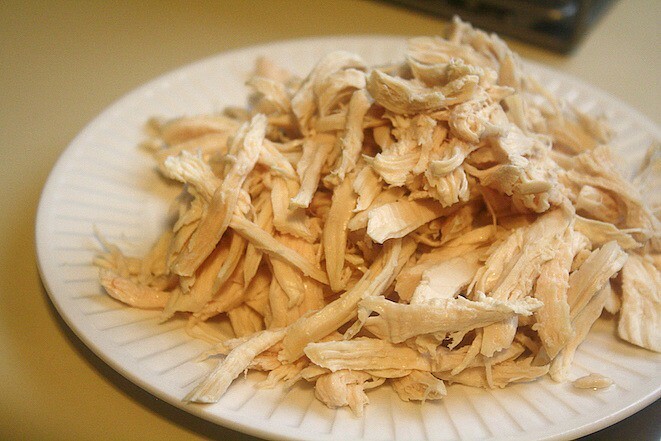 Once the chicken is cool enough to handle, go ahead and shred it with your hands or forks . . . whatever your preferred method is. 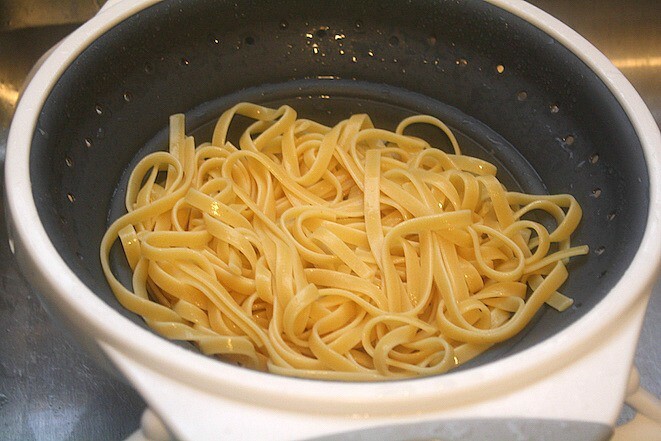 Transfer the pasta to a large bowl. 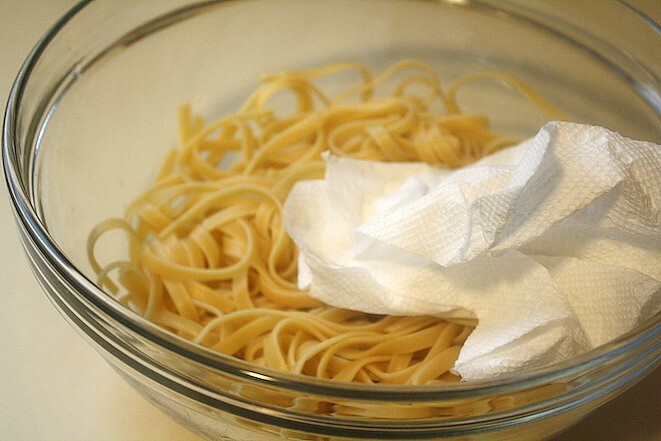 Use a paper towel to pat the pasta as dry as possible. (The idea here is to have the noodles be dry so they absorb the flavors from the sauce better.) 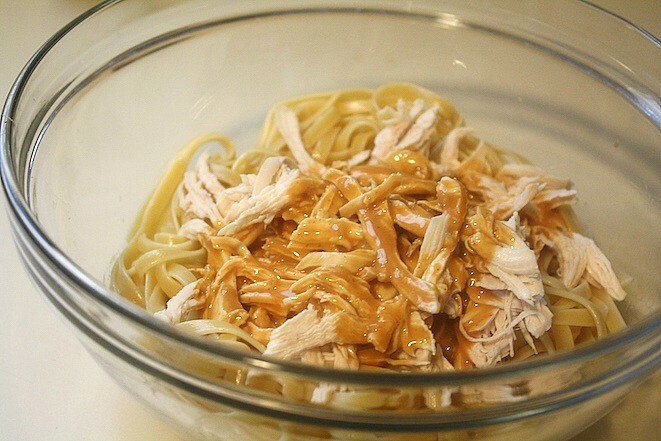 These Chicken Sesame Noodles are almost done. It’s time to throw the dish together! 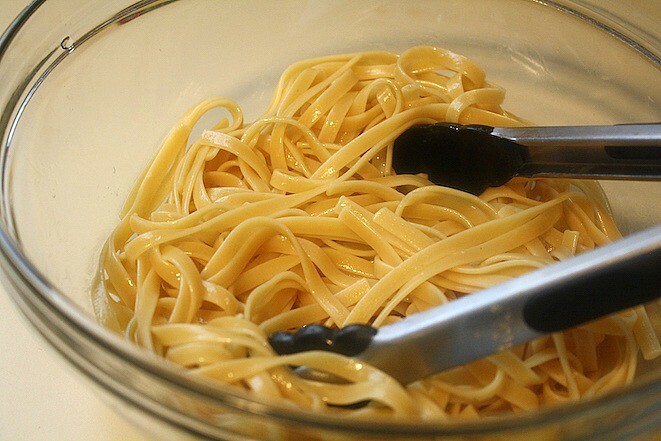 Add 1 teaspoon of sesame oil to the pasta and toss to make sure the pasta is well coated. Add the shredded chicken to the bowl. 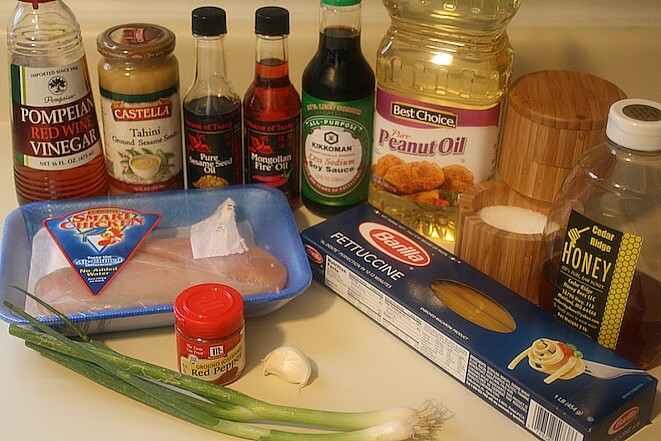 Then pour the sauce over the chicken and noodles. 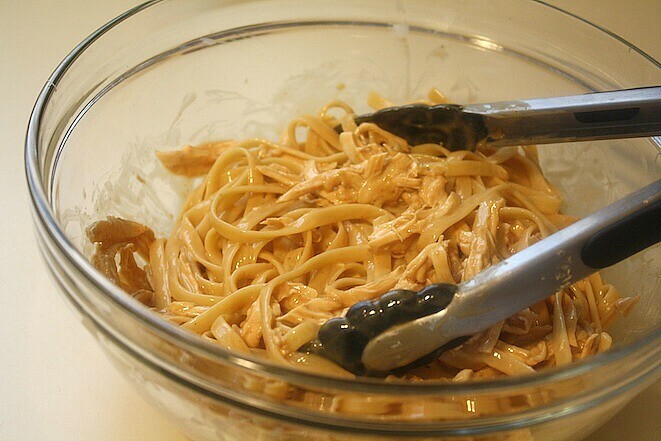 Finally you’ll toss until the chicken and noodles are coated in pasta. And that’s it! Chicken Sesame Noodles are done and ready to be devoured. 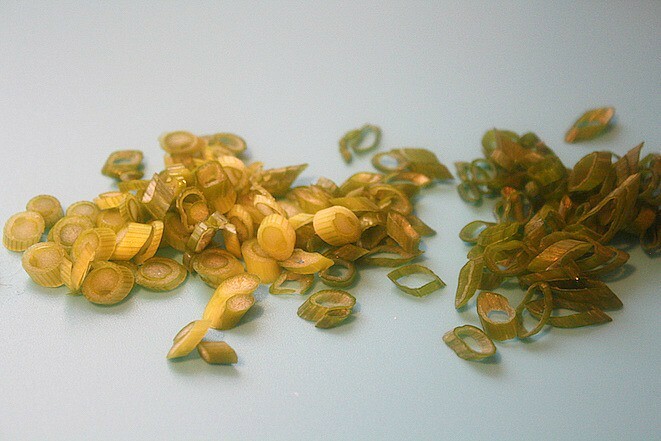 Garnish with the sliced scallions and serve right away. Happy slurping! Prepare for this recipe to knock your socks off. It's packed with awesome flavor and comes together in a snap! 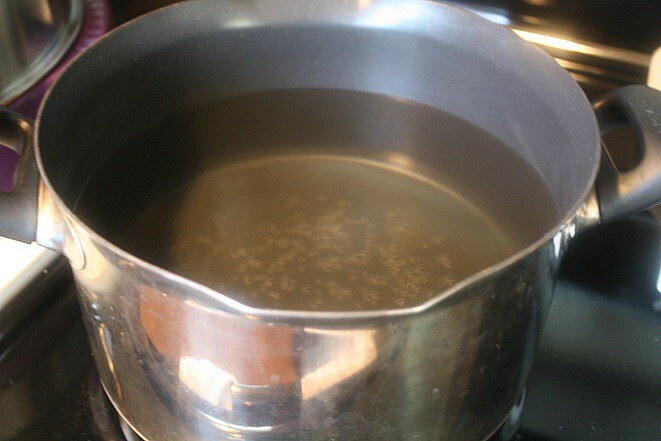 Bring a large pot of water to a boil (filling i about two-thirds full). Then add the chicken breast to the water, cover the pot, and remove the pot from the heat. If it’s one breast then let it sit for 15 minutes. But if you’re using 2 small chicken breasts allow it to sit in the water for 12 minutes or until the chicken is cooked and tender. Remove the chicken from the water and cut to ensure the chicken is cooked all the way through. If it’s not, place it back in the water until it’s fully cooked. Do NOT discard the water. 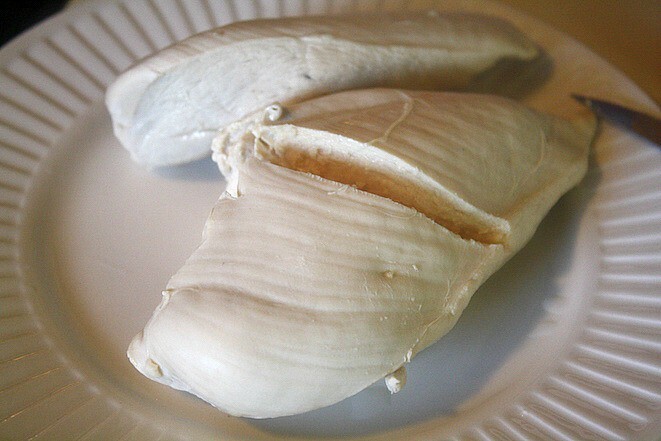 Once the chicken is cool, shred it with your hands or forks so it’s in bite-sized pieces. 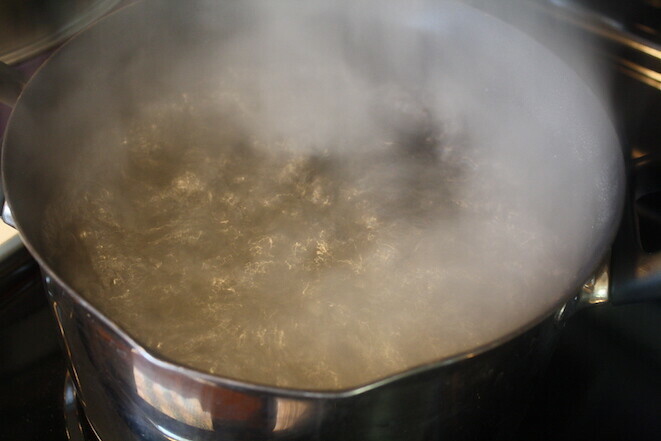 Once the chicken is removed from the water, bring the water back to a boil. Then cook your fettuccine according to package directions until it is al dente. When the pasta is cooked, drain it in a colander and rinse thoroughly with cold water and shake the colander to drain any excess water. While the pasta cooks, mix up the sauce. 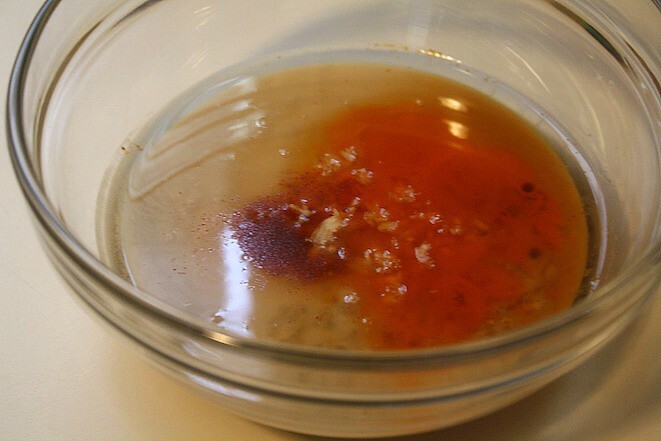 In a medium-sized bowl combine 1 teaspoon of sesame oil, the peanut oil, tahini, soy sauce, red wine vinegar, chili oil, honey, cayenne pepper and minced garlic. 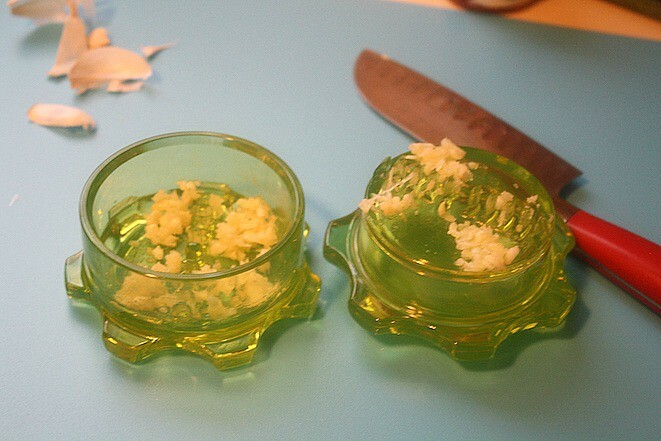 Whisk the sauce until it’s really smooth. Once the pasta is well-drained, transfer it to a large bowl and use paper towels to pat the pasta as dry as possible (so that the pasta can absorb all of the flavors). Then toss the pasta with a teaspoon of sesame oil. 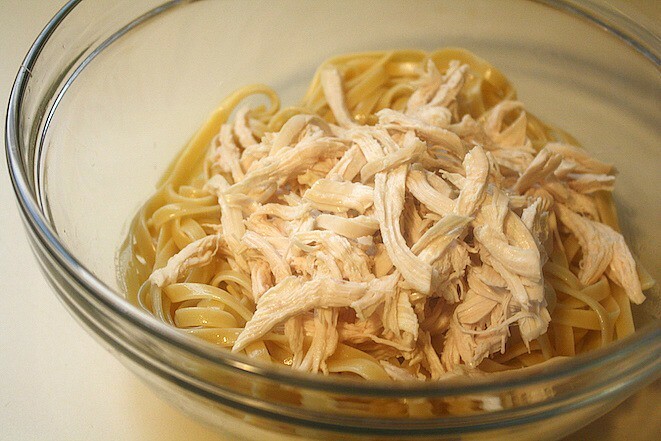 Add the shredded chicken and sauce and toss until the sauce is coating the pasta and chicken. Serve right away and garnish with sliced scallions. Enjoy!